The Metropolitan Museum of Art was so crowded over the Christmas holiday. Despite the absolutely incredible art, it was not fun being constantly jostled inside the buildings. The collections are so extensive that it is hard to navigate once inside. I did find my way to the Cezanne to Picasso exhibit, which was outstanding. I had already checked the exhibit catalog out of the library, so the paintings looked vaguely familiar. A relative had warned me that the label copy was a little tedious, so I did not fight the crowds to read all of the captions. But I did enjoy some marvelous Gauguin's, Cezanne's, and Van Gogh's. In fact I liked most everything except for the later works by Picasso. It had been a long day and I needed to sit down, get warm, and rehydrate. 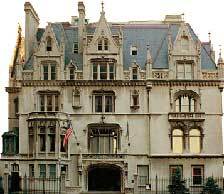 On the corner of Fifth Avenue and 79th Street is the elegant and ornate Ukrainian Institute. Admission was $5 to see lousy contemporary art by Ukrainian artists for sale, but that was not the point. It was empty, quiet, and warm inside. The couches were exceptionally comfortable and the interior of the building itself was handsome. The carved wooden banisters were a treat as were the moldings and doors. I sat and wrote until I regained my strength. It was $5 well spent. You may wonder why I would pick General Grant's Tomb to visit of all things on a brief visit to Manhattan. I had seen the exterior numerous times and even heard Dizzie Gillespie perform there for free in the summer of 1981. It was part of the Cool Jazz Festival. This time I went inside. There was not that much to see. The actual tombs of the General and his wife resembled les Invalides in Paris, where Napoleon is entombed. Another benefit of the visit was that I could get a stamp in my National Parks Passport. I have only collected a few cancellations in it since 2004. The beautiful main campus of Columbia University designed by the architectural firm of McKim, Mead, and White, is only a few blocks from Grant's Tomb. Low Library is truly grand with what is known as "the steps" that lead down to street level. There were no students on campus as the University was on winter break. But there were many of us tourists admiring the campus. Then I had lunch at Tom's Restaurant. The outside was an integral part of Seinfeld although the inside looks much more like a typical inexpensive Manhattan Greek diner. The Hall of the African Peoples is an old exhibit but I enjoyed the fact that some of the label copy would never be written today. There were lots of religious, farming, and hunting objects, as well as musical instruments and masks. A diorama of Berber people in the desert was very dark as was much of the exhibit. But the actual objects were of top quality throughout and well worth the hour that I spent in that section. That was all that I saw of the Museum on this visit to NYC. Yesterday it was forecast to be in the upper 60s, so I took the day off from work and returned to Providence. I spent my time on the College Hill section of the City where Brown University and the Rhode Island School of Design are located. I walked for several miles getting quite a workout in the process. My tour began at the First Baptist Church that was constructed between 1774 and 1775. Very large with a nice chandelier in the center of the sanctuary. Besides that it was of a simple and rather unadorned Georgian style. Although of great historical significance I would not make the self-guided tour a priority on a day trip again. Roger Williams founded the Baptist church in Rhode Island in reaction to the puritans of Massachusetts from whom he had fled. The Providence Athenaeum is a private library housed in a Greek Revival building. The inside is handsome and must be a nice place to curl up with a book or to write. I received a very gracious welcome there. But the highlight of the day was the small, one room, Haffenreffer Museum of Anthropology on the campus of Brown University. The exhibit Believing in Africa was largely curated by undergraduate and graduate students. It looked at Islam, Christianity, and native spiritual beliefs in sub Saharan Africa. The wooden masks and other objects were of excellent quality and the text and label copy were very well written. The sole employee in the Museum at the time was very welcoming and interesting to chat with. The main section of the Brown campus was very handsome.